The Last Word is another of those cocktails that just doesn’t look right on paper. Chartreuse and Maraschino? C’mon, man, that doesn’t make any sense at all. I suppose that’s why it took me so long to get around to trying it. It turns out that Chartreuse and Maraschino makes a lot of sense, in a 1+1=3 sort of way. The Last Word Cocktail appeared just in time for the start of Prohibition, and has been perilously close to being forgotten altogether for all of its existence. The contemporary recipe books gave it no notice; it was thirty years before Ted Saucier first published it in his 1951 Bottoms Up ; according to Saucier, vaudevillian Fred Fogarty introduced it to the Detroit Athletic Club in the early 1920s. Its disappearing act in the mean time suggests that it never went further than the DAC’s Tap Room Bar. I’d like to know the story of Saucier’s discovery: the Last Word’s three lost decades, buried in the DAC’s bar book, or in an unknown barman’s memory through Prohibition, Depression, and war. I’d like to know where it had been, and how it finally came to light. But even Saucier’s attention wasn’t enough to popularize it; the Chartreuse and Maraschino combination is a tough sell, and the Last Word was lost again, a footnote to cocktail history for another fifty years. As the story goes, Murray Stenson at Seattle’s ZigZag happened across Saucier’s writeup, gave it a try, and in 2004 started promoting it to minor celebrity in the cocktail fashion world. I’m glad he did. Shake until cold; double strain into a chilled cocktail glass. No garnish. I’ve made the Last Word with many gins, and it has been very accommodating. The astonishing miracle of this drink is that two aggressive spirits—one sweet and fruity, the other earthy and herbal—can manage to balance each other’s strengths and weaknesses. If you get the four ingredients perfectly balanced, you can taste and identify each of the components, but none dominate. And a properly balanced Last Word, despite the complexity of its flavor, is a seductive and surprising gin sour. I find the drink balances best if I short the green Chartreuse just a bit. As always, serve the Last Word small and dead cold. Chartreuse and Maraschino stop being your friends when they warm up. I’d be interested to know what discussion was at hand when this drink gained its cryptic name—it must represent the last word about something. I’d like to think it was the last cocktail they made before Prohibition closed the bar, but that’s just the romantic in me. Anyway, the Last Word has finally found its day in the sun. It is Detroit’s gift to cocktailians, and it deserves a little celebrity. But celebrity is neither success nor survival. Maraschino is a niche ingredient and Chartreuse even more so. I suspect that if you’re reading this blog, you are more likely than most to have such things on the shelf at home, but we represent a tiny segment of the population; people won’t use what they don’t have, and let’s face it, Chartreuse is way down the list of regularly needed ingredients for home bartending. The same goes for taverns—there aren’t many in my market that would know a Last Word from a hole in the ground. I would say we still have to wait and see. I, for one, am rooting for the Last Word. Next time: Last Word variants. Perhaps they’ll help this cocktail survive. “Detroit’s Finest: The Last Word Cocktail” at cold-glass.com : All text and photos © 2011 Douglas M. Ford. All rights reserved. Couldn’t have said it any better. Never tried the Last Word before, but will add it to the list of to-do’s. Perhaps I will even order one up at the Zig Zag. My first encounter with the Last Word is fairly recent, and I couldn’t help but wonder how I got this old without knowing that this was going on. Never been to ZigZag, but on the face of it, it seems like it would be an excellent starting point. Have fun! That was quite delightful. The sweet, nuttiness of the Luxardo Maraschino balances the Chartreuse. The lime complements the spiciness. Best Chartreuse cocktail I’ve had so far. It’s really exciting to know you found something new that you enjoy. I’m a happy guy tonight. Great cocktail. Your speculation about the yellow vs. green Charteuse is corrted in my opinion. Did side-by-side taste testing last night…the one made with yellow was definitely a little better balanced. It’s a matter of taste, though! Thanks! It’s easier to balance than the Aviation, but I think I might prefer the way the Aviation pits some bitterness (from the creme de violette) against the citrus. 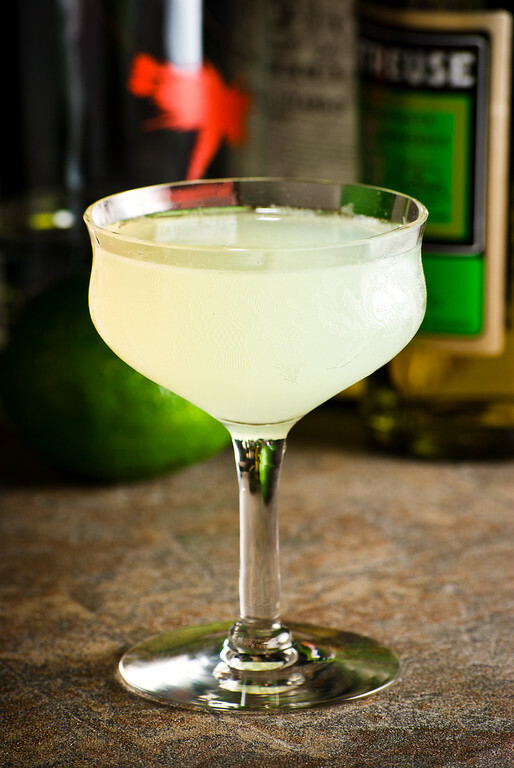 It may just be the lime I used in this Last Word – it’s more powerful than I expected. Maybe I’m just not enough of a fan of sours. But the Chartreuse and maraschino do work well together. Bitterness v. citrus, that’s an interesting observation, and a subtlety I don’t always think about. I know what you mean about sours—my love for them comes and goes. One season, they’re my favorite thing; the next season, I’ll stay away altogether. Curious how tastes change.